Favignana, Levanzo and Marettimo, just 7 kilometers from the shores of Trapani, are the three main islands of the Aegadian Archipelago which also includes other minor islands. The whole archipelago is the widest protected marine area in Europe, with plenty of rare flora and fauna species both on the island and underwater. 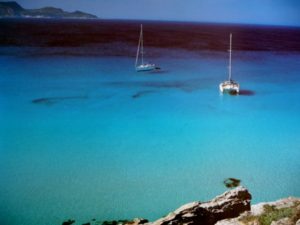 Favignana, the biggest and most famous butterfly-shaped island, is a true natural paradise: cliffs and bays with an incredibly transparent sea, caves hidden underneath the sea and Mt. Santa Caterina, 314 meters above the sea level, if you’re looking for breath-taking overlooks. Together with tourism, most activities that make Favignana famous worldwide are its ancient tradition of tuna fishing (the famous “Tonnara” of the Florio family has recently been renovated and is now open to the public) and its tuff caves. The pretty village has everything required for a holiday, and restaurants always serve fresh fish – don’t forget to taste the typical red tuna at least once during your stay in our Favignana villas! Marettimo is smaller, less crowded and quieter than Favignana. Most tourists enjoy daily excursions to this island, looking for its stunning caves and grottos – most of which can be only accessed through the sea, as well as for its interesting and scenic trekking routes. The tiniest island, Levanzo, is also perfect for a one-day excursion: the beauty of the island is very well preserved thanks to the very little traces of human presence – just a bunch of small white houses. The most interesting feature of the island is the world-famous Grotta del Genovese, a cave looking out onto the shore: one of the most important archaeological sites in Italy, with its cave paintings and incisions dating back to the Upper Paleolithic. If you’re looking for something more wild and secluded, but yet glamorous and refined, then you should consider one of our charming Pantelleria villas. This volcanic island is actually closer to Africa than it is to Sicily, and both shores can sometimes be observed to the naked eye. Its landscape is unique: rocky cliffs and hidden caves on the coast, and a wild inland environment where some typical human artifacts can be found. The “panteschi” gardens, used for protecting citrus trees from the wind, and the famous “dammusi” houses are very typical of Pantelleria, together with the delicious “passito” wine. Most interesting natural sites include the “Arch of the Elephant”, a rock plunging into the sea in Cala Levante, and the Venus lake, surrounded by a verdant landscape and most renowned for the healthy properties of its water springs. The urban centre is tiny, pretty and refined: a glamorous atmosphere for a very exclusive destination. If you are looking though for an accommodation on the main island take a closer look to our holiday rentals in Sicily catalogue.